If you only saw one show at SXSW, I hope it was Polica. If you didn’t see them, I hope you’re listening to them in your cubicle right now. Although, to be fair, their recordings don’t do them justice. The band’s live performances are like breathing life and reality into the abstract. 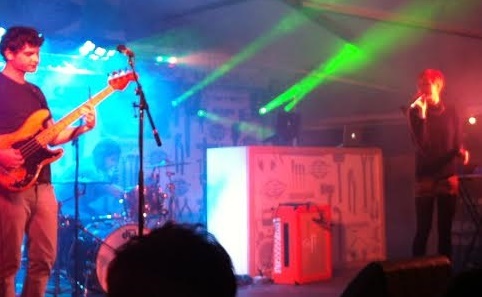 If bands were pieces of art they’d be a Picasso masterpiece.I saw them at Banger’s, an outdoor venue on Austin’s Rainey Street which never disappoints. The backyard was at max capacity as soon as the show began. At the beginning, there was a clear division between die-hard fans near the stage and casually curious listeners loitering in the back near the bar. After their set, there was no difference—we all left die-hard fans, not to mention nursing a bit of a girl-crush on the lead singer, Channy Leaneagh.If you’re the kind of person who goes to shows for the entertainment value (dance, lights, a feast for the eyes) you’ll love them live. If you’re the kind of person who vehemently refuses to see anything sub-par, you need to see them. If you go to shows to make you happy, or to make you think, or to give you a taste so you develop yet another costly band addiction—see them. They’re transcendent. She’s ethereal. The show is otherworldly. I’m going to burn a hole in my thesaurus trying to describe the way this show makes you feel. You just have to experience it for yourself.